C.H. Robinson Worldwide, Inc. sponsored the area's first DODGE THIS! Dodgeball Tournament. 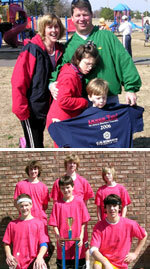 The tournament took place on Saturday, March 4th at the Herman W. Cox Community Center in Collierville,Tennesse. Two teen teams and twelve adult teams (18 & up) battled it out on volleyball courts in the community center's gym, donated by DAC (Desoto Athletic Club). The rules were the same as in elementary school; only the balls had more power behind them! The two teen teams, Power Puff Guys and The Hitmen, were allowed to play 5 games in a match, for the best 3 out of 5 games. The Power Puff Guys emerged victorious and were presented with their first place trophy. The adult teams came ready to play. The Beavers, Crackshots, Express, Fat Kids on the Block, Flame Throwers, Losers, Lot Lizards, Mean Machine, Service Master Clean, Supersnags, Sunshine Slingers, and Visual Thunder, brought their comical names, amusing shirts, and good sportsmanship. Once brackets were prepared, the games began. Each match consisted of the best 2 out of 3 games. Spectators "ooohed" and "ahhhhd" at the hits many of the competitors endured, and were amazed at just what the players could do to avoid getting hit. The teams made their way through the brackets, with Service Master Clean and The Beavers arriving in the championship match. After two games, the score was tied, fans were cheering, and nails were being bitten. Service Master Clean pulled off the win after being up two men to one in the last seconds of the game. The tournament winded down with John Strange, Branch Manager of C.H. Robinson Worldwide, Inc., announcing the real winner was Ryan's Hope for Family and Friends. The tournament was held to raise funds for this Collierville organization that seeks to build a bridge "between exceptional needs families and the community by providing support, relief, and recreation." Approximately $9000.00 was raised from this single event, which will aid Ryan's Hope in building a new playground in Collierville. Ryan's Place will be a universally accessible playground for all children to enjoy. To learn more about Ryan's Hope, and how you can help, please visit their website at www.ryanshopeinc.org. DODGE THIS! Dodgeball Tournament was also sponsored by Fed Ex, DAC- The Sports Club, Service Master Clean, Southern Massage Institute, and Phillip's Auto Body.